Awesome!!! Reportedly had an offer from Kansas State. Earned the 3rd highest ranking in 2016-17 Tennessee class per Rick Bolus. Written by Rick Bolus on 02 December 2015. Holy Cow!!!!! Major Heist for the Aces!!!! Welcome Silas and thank you. You will like it here!!!! klinky wrote: Earned the 3rd highest ranking in 2016-17 Tennessee class per Rick Bolus. That's a loaded HS team. 3 of the top 4 seniors and #1 in the "second 15". So Silas's stats are probably not fully representing his contribution and talent. Last edited by SI_Acesfan on Wed Aug 17, 2016 9:56 pm, edited 2 times in total. I am totally hyped about this recruit. Sounds like an awesome kid with a lot of upside. 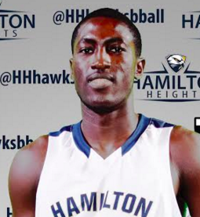 Adheke's talent, hard work and rapid progress caught the eye of college scouts during last summer's AAU circuit. He already is rated one of the nation's top college prospects for the class of 2017 with more than 10 universities, including Georgia Tech, Stanford, Tennessee, Vanderbilt, Virginia Tech and Princeton already recruiting him. great get for the Aces!! 3star player! !